Dimensions 1 by 6 by 9.25 in. The passage of the Telecommunications Act of 1996 inaugurated a new and highly volatile era in telecommunications. The first major overhaul of U.S.
communications law since 1934--when no one had a television set, a cordless phone, or a computer--the Act was spurred into being by broad shifts in technology use. Equally important, this book shows, the new law reflects important changes in our notions of the purpose of communications regulation and how it should be deployed. Focusing on the evolution of the concept of the public interest, Aufderheide examines how and why the legislation was developed, provides a thematic analysis of the Act itself, and charts its intended and unintended effects in business and policy. An abridged version of the Act is included, as are the Supreme Court decision that struck down one of its clauses, the Communications Decency Act, and a variety of pertinent speeches and policy arguments. Readers are also guided to a range of organizations and websites that offer legal updates and policy information. 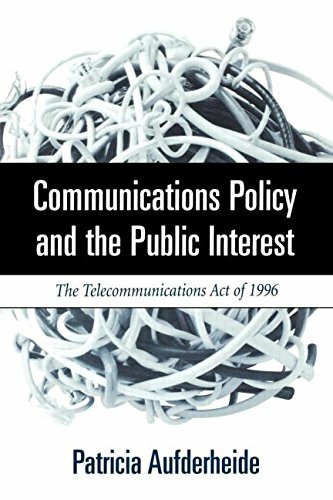 About: The passage of the Telecommunications Act of 1996 inaugurated a new and highly volatile era in telecommunications.